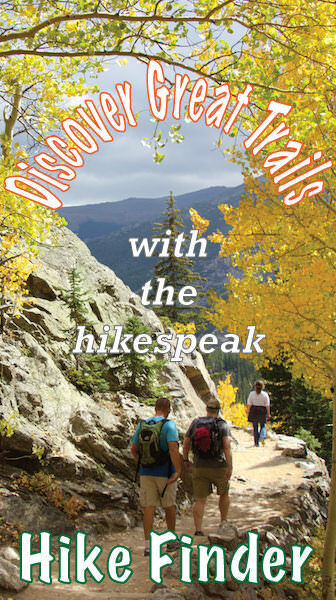 Do you like to hike but suffer from a little bit of fomo (fear of missing out)? 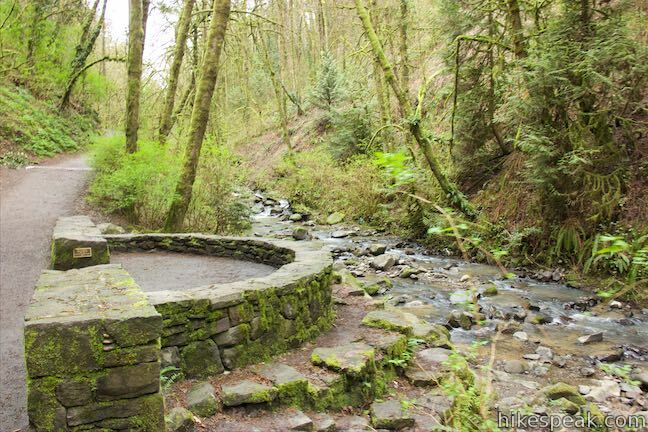 Make your way to Northwest Portland for an outing in Forest Park that has a bit of everything. 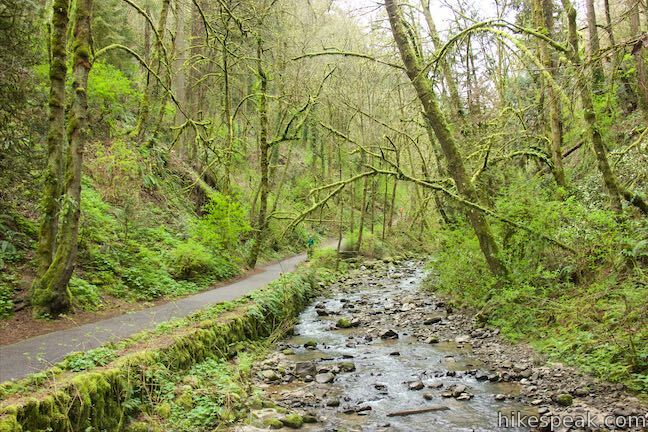 Start up Lower Macleay Trail along Balch Creek, the park’s biggest year-round stream. 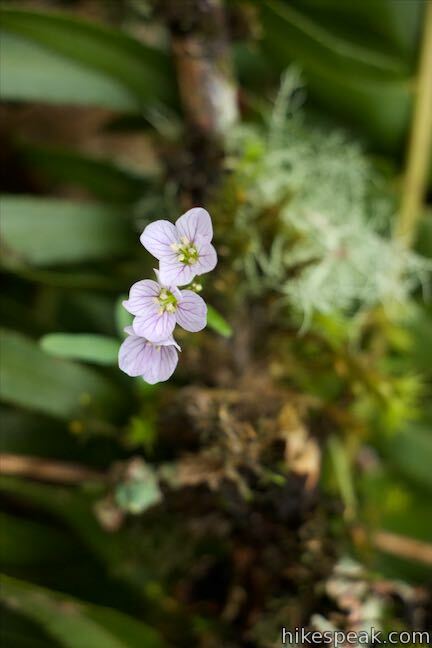 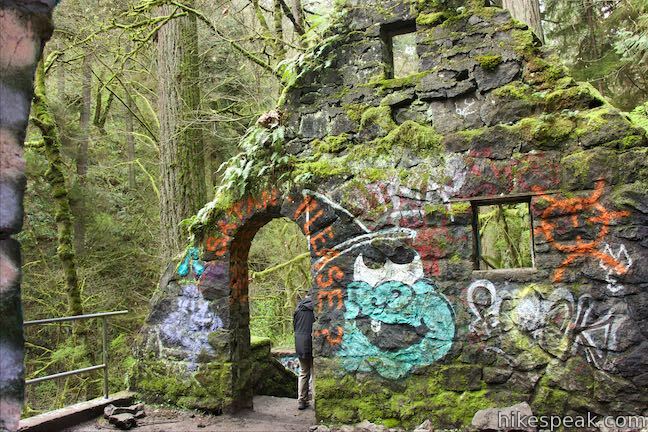 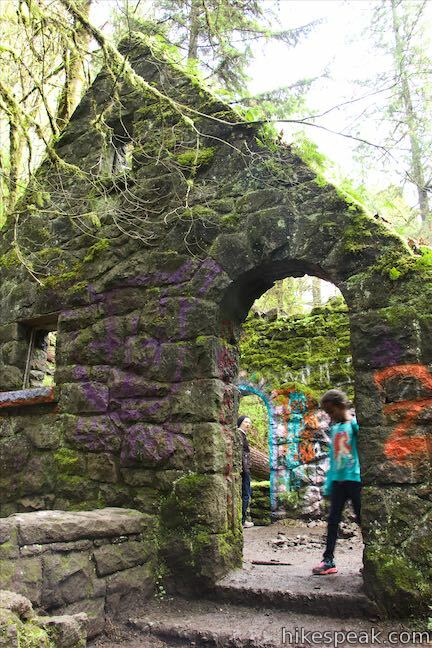 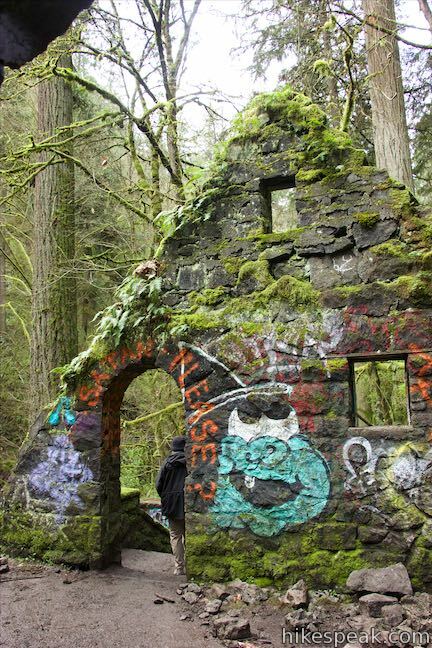 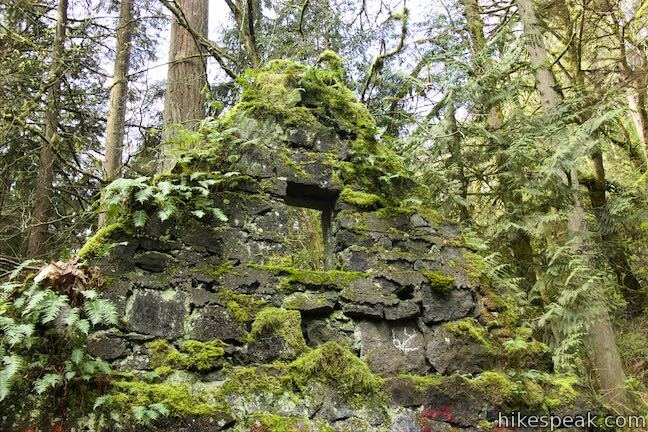 Hike less than a mile through a verdant rainforest to arrive at Stone House (imaginatively nicknamed the Witch’s Castle), where the ruins of an old building are alluringly grown over with moss and ferns. 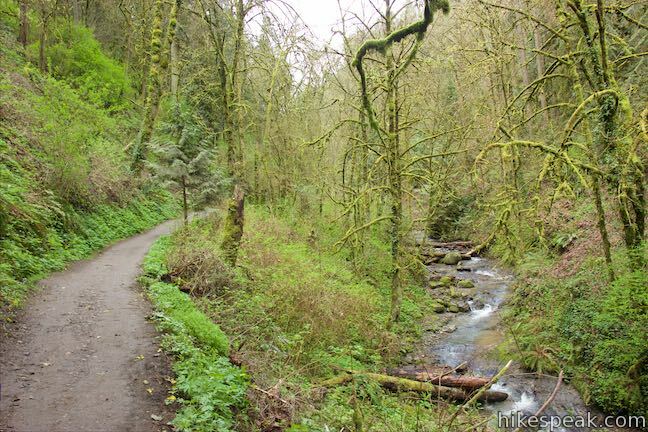 From there, you can loop back on a different route. 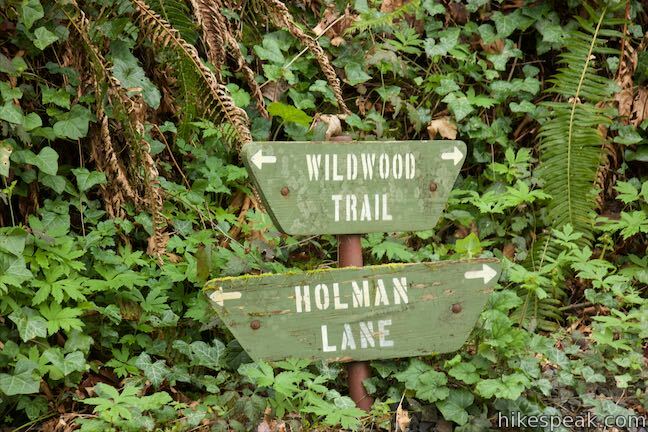 Take Wildwood Trail north to Holman Lane and diversify your hike back with a stroll through the Willamette Heights Neighborhood. 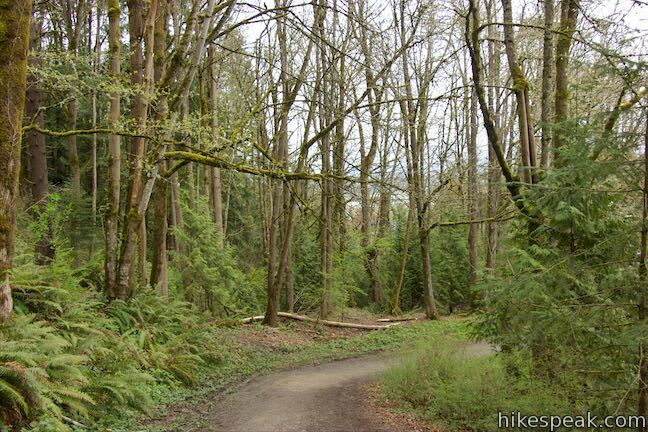 This loop is 2 miles long with 400 feet of elevation change. 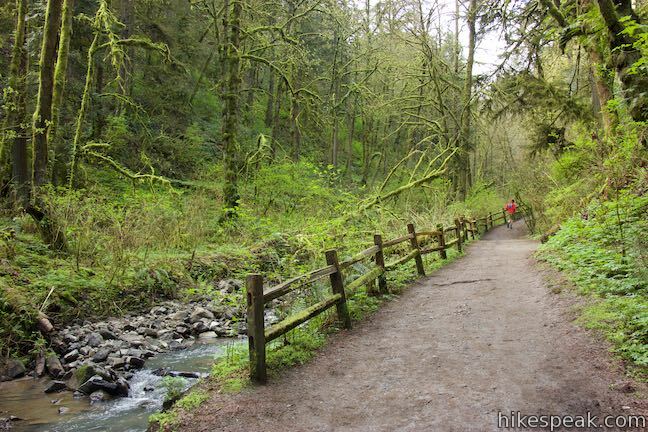 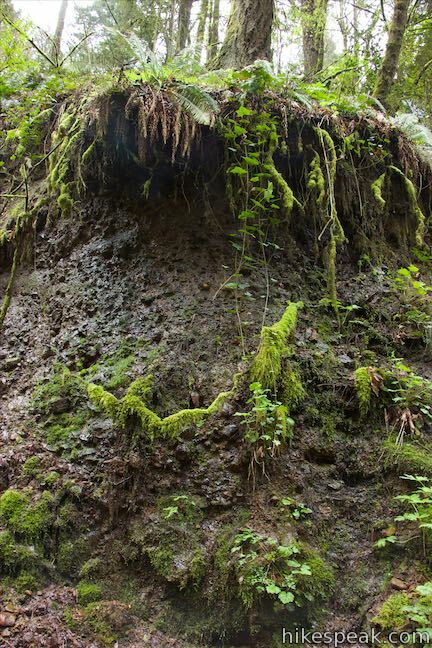 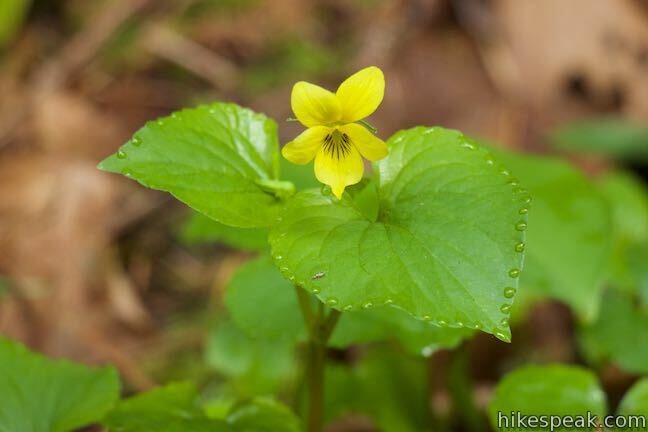 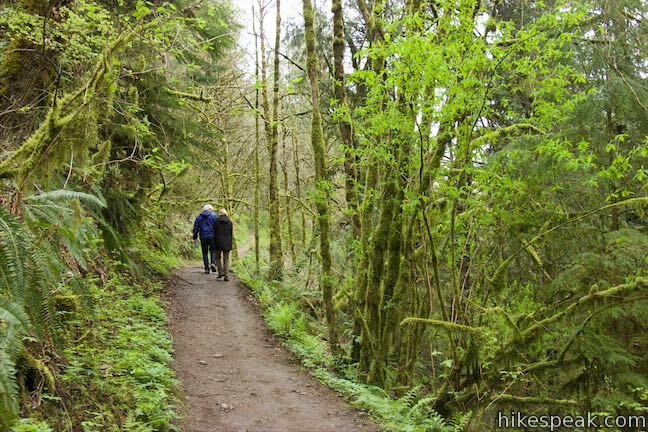 Hiking out and back on Lower Macleay Trail is just 1.8 miles round trip with 210 feet of elevation change. 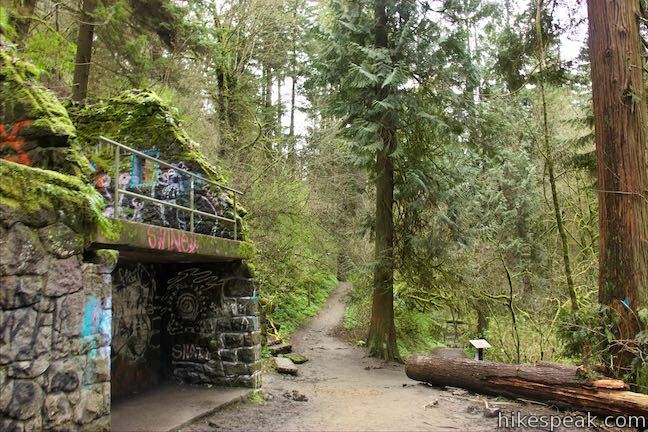 From Stone House, you can also venture south on Wildwood Trail and ascend to Pittock Mansion for panoramic views over Portland. 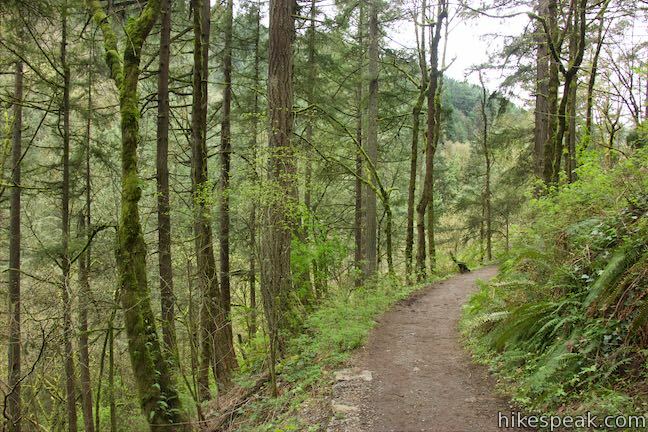 Reference Lower Macleay Park to Pittock Mansion for more information about this longer hike, which ascends 850 feet of elevation and is 5.4 miles round trip (of 5.6 miles with the lower loop through Willamette Heights). 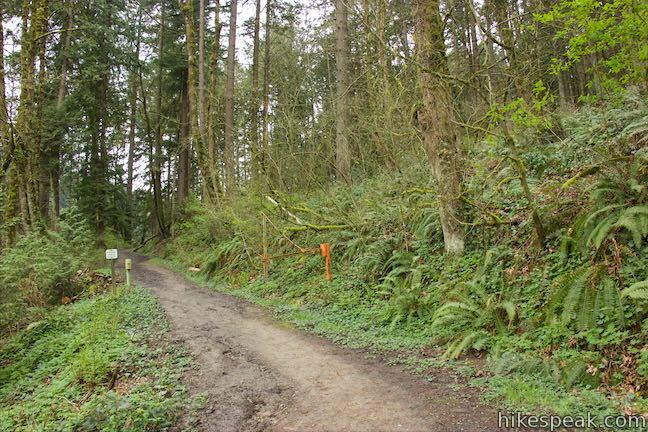 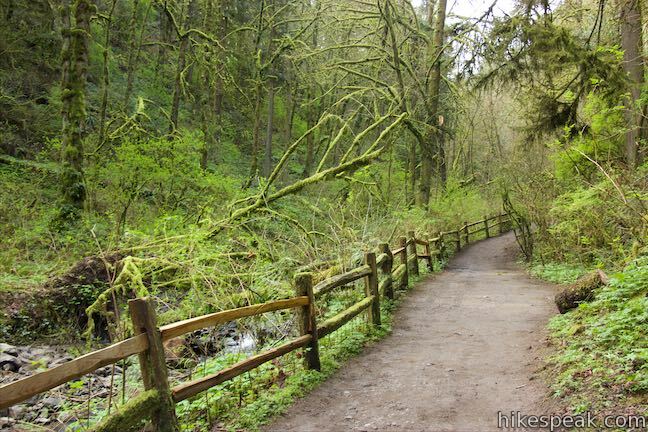 Lower Macleay Trail offers quick and convenient access to a prize park running northeast of downtown Portland. 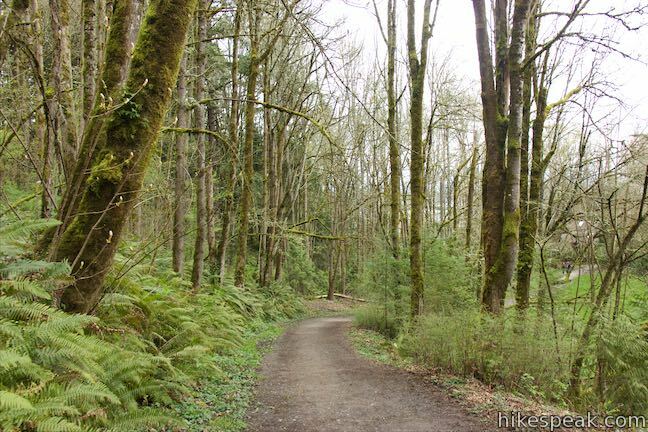 Forest Park covers over 5,000 acres and has more than 80 miles of trails through “one of the largest natural forested urban parks in America.” Set out from a trailhead at the end of NW Upshur Street and take the paved trail south through a lawn. 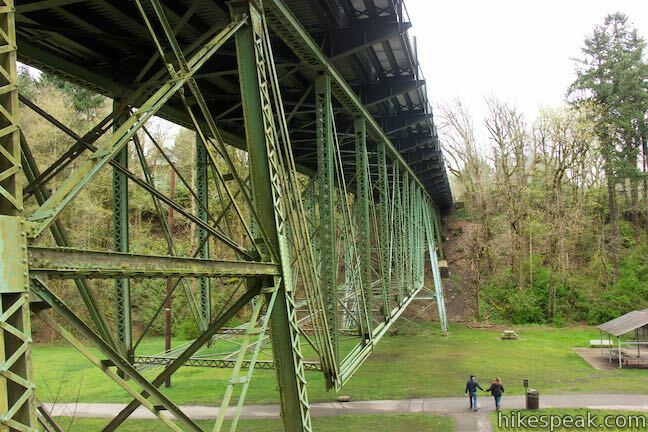 The 1905-built (but 2014-rehabilitated) Balch Gulch Bridge passes overhead. 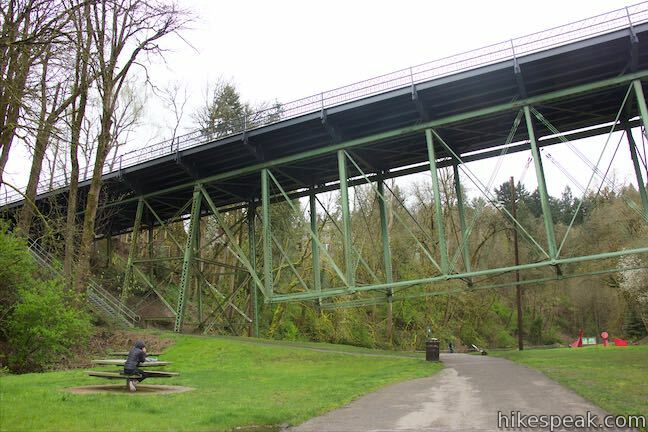 Go straight through a junction on the left with a trail to the Lower Macleay Stairs, which come down alongside the bridge and are used and the end of the 2-mile loop after the walk through Willamette Heights. 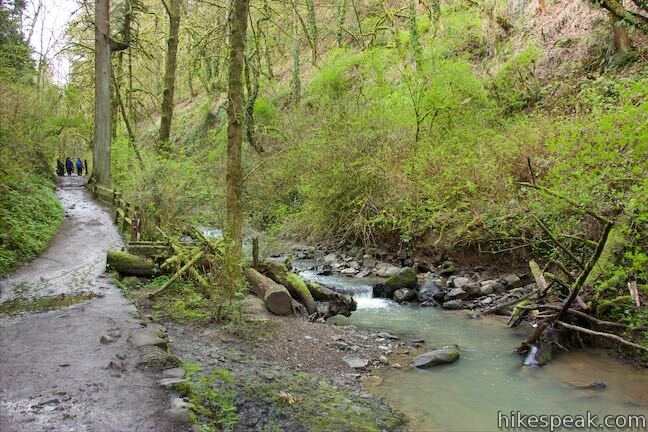 Beyond the bridge, approach a helpful trail kiosk on the right. 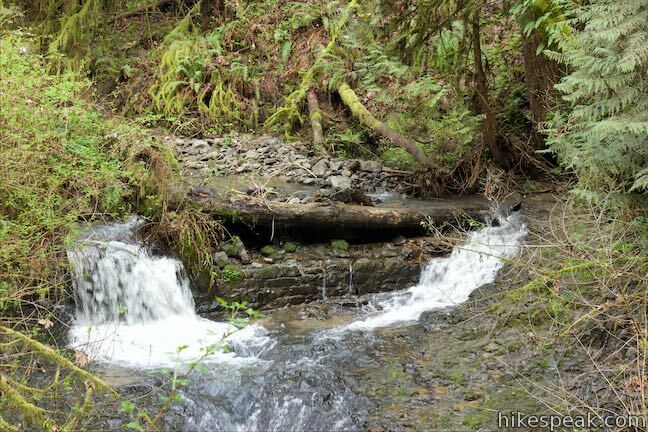 Balch Creek flows along the left side of the trail through an interesting gated system that appears to be some sort of control for flood debris. 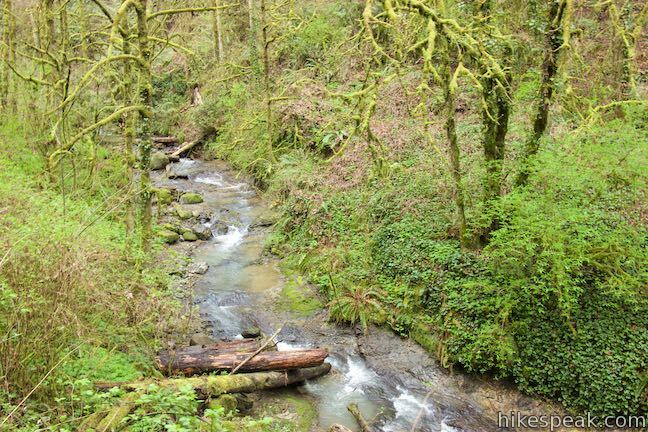 Balch Creek is a habitat for cutthroat trout. 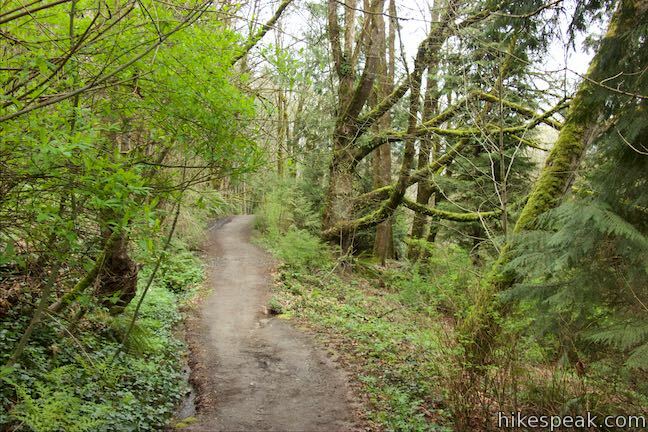 Proceed up Lower Macleay Trail, which stays paved for a stretch as it begins a gradual course along the tumbling creek. 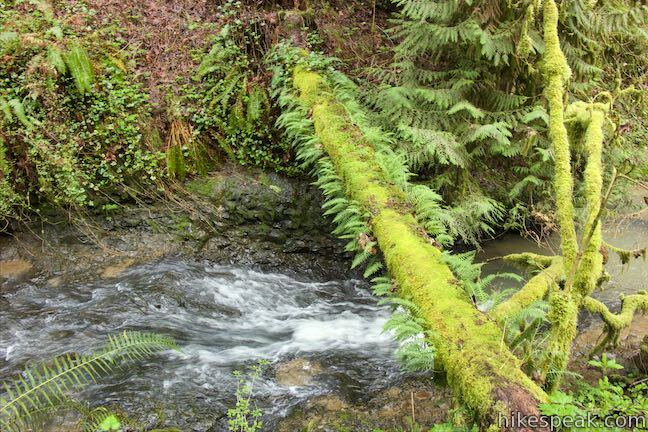 Cross a stone footbridge to the left side of the creek and get a nice perspective up and down the gulch. 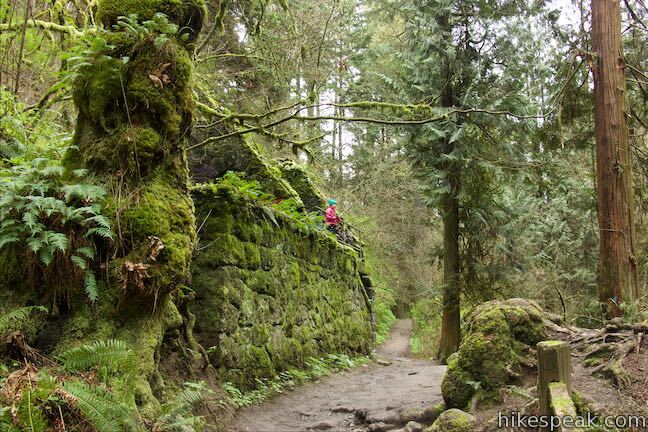 Shortly after that, and 0.2 miles from the start, the trail reaches a Stone Overlook next to the creek. 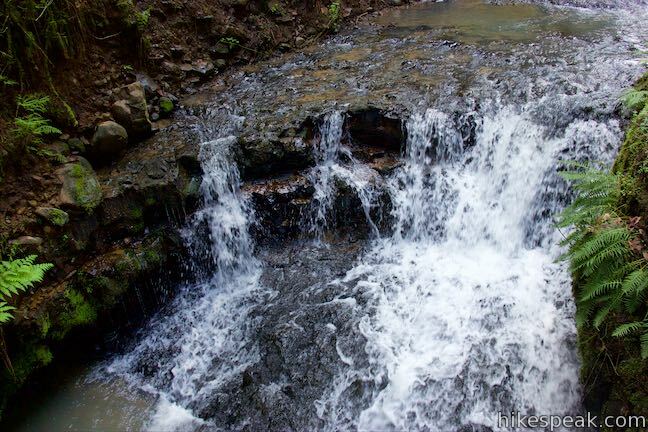 Pause to watch the water leisurely sliding over rocks. 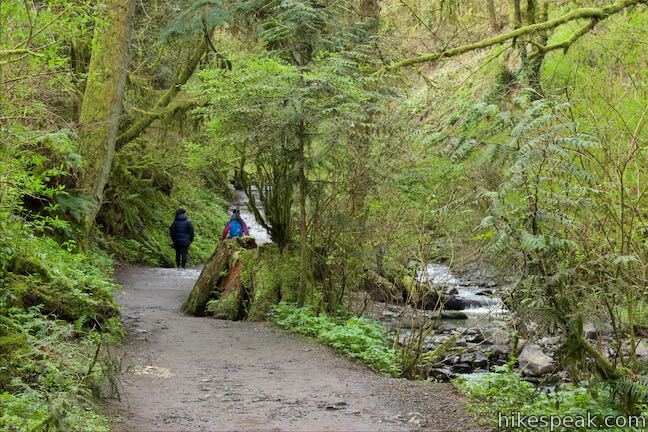 The pavement ends just ahead, so this is the turnaround point for the wheelchair-friendly version of the hike. 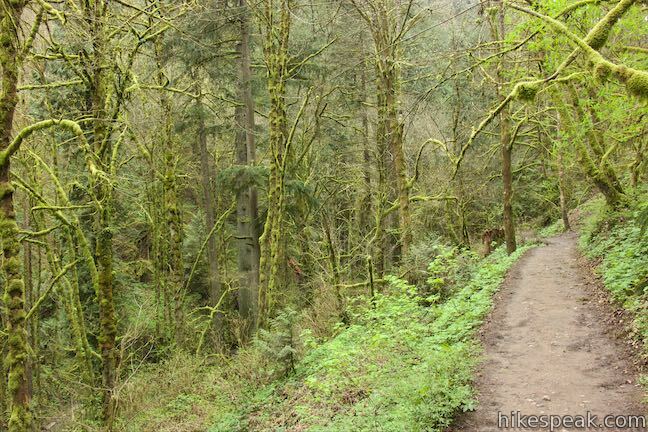 Lower Macleay Trail is unpaved for the duration. 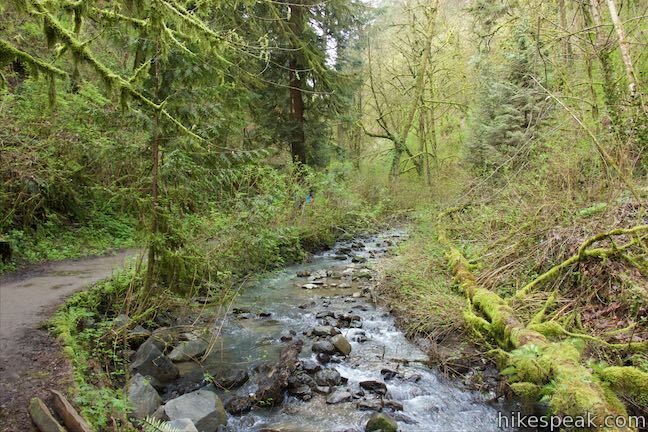 The dirt trail tilts up in a few places but remains relatively gradual for an easygoing creek side hike. 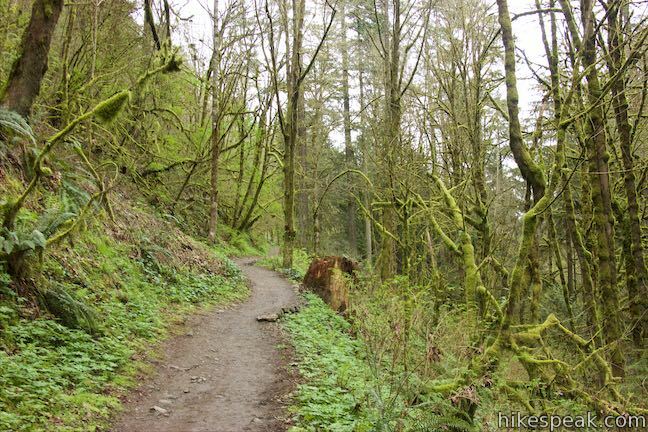 While the trail doesn’t pick up much elevation, the sides of the gulch are steep. 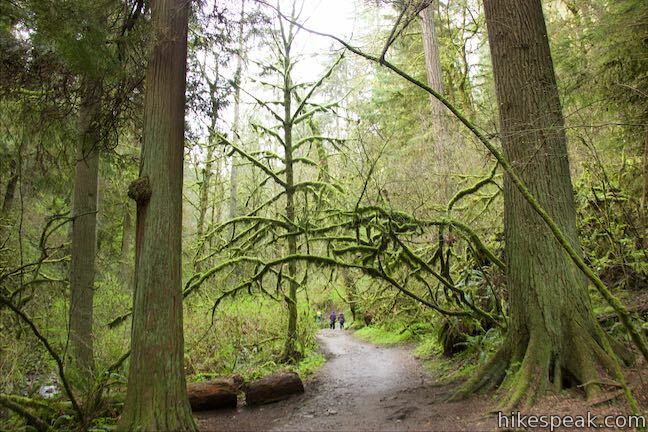 Oaks, cedars, and firs rise overhead with trunks and branches covered in moss and lichens. 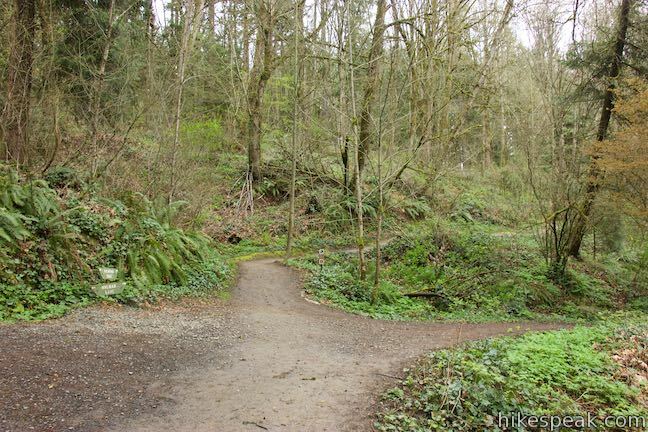 The ground is covered in greens too, including a variety of ferns. 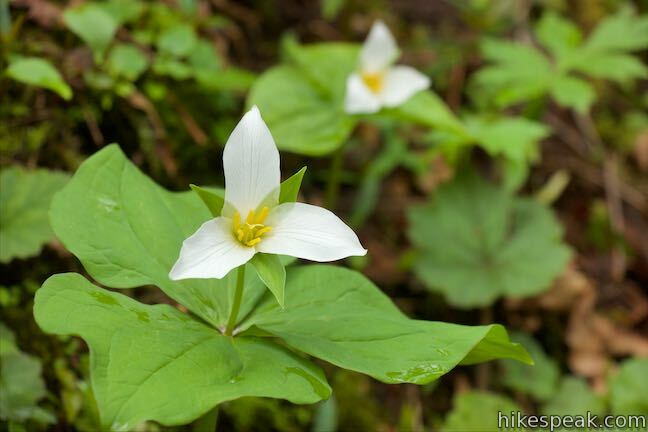 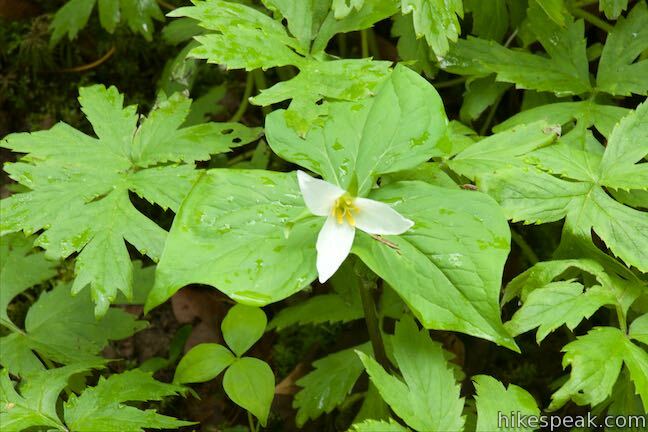 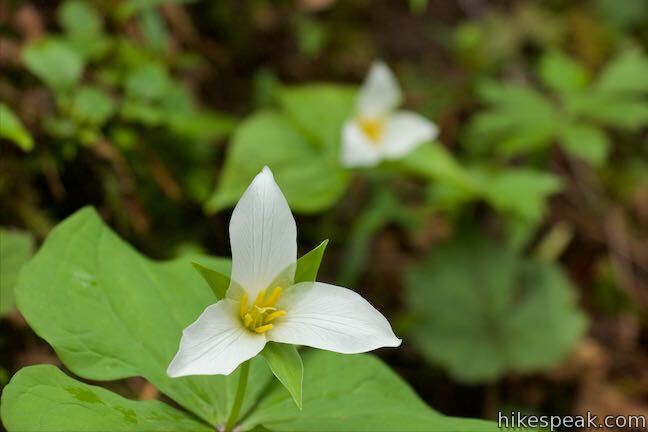 Trillium bloom along the trail in the spring, adding tri-pointed splashed of white and pink. 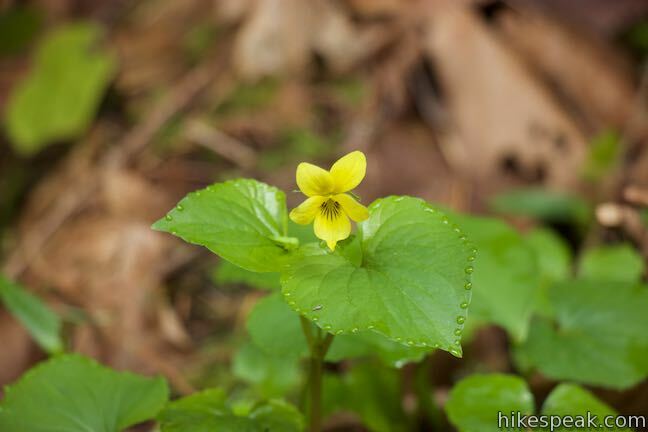 Salmonberry bushes along the stream flash flowers of magenta while yellow violets contribute even more pops of color. 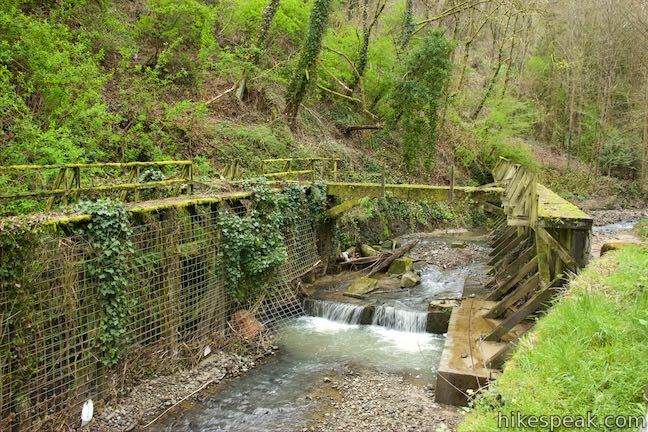 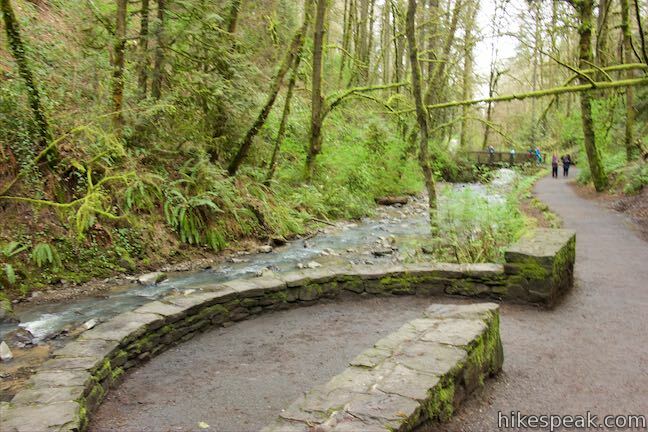 At 0.45 miles from the start, take a pair of bridges back to the right side of the creek just below a short crescent-shaped cascade. 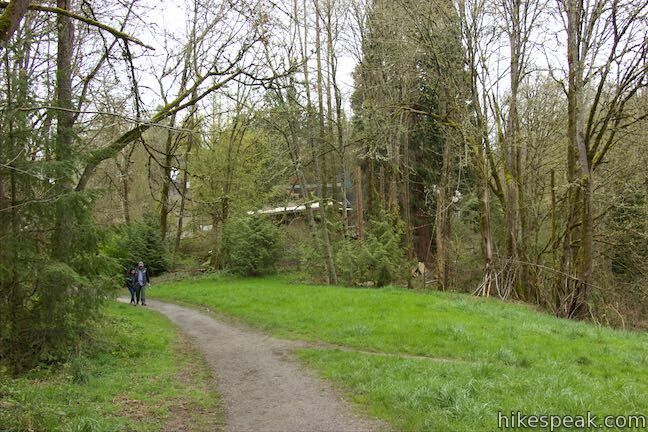 Lower Macleay Trail stays on the right side of the creek from this point on. 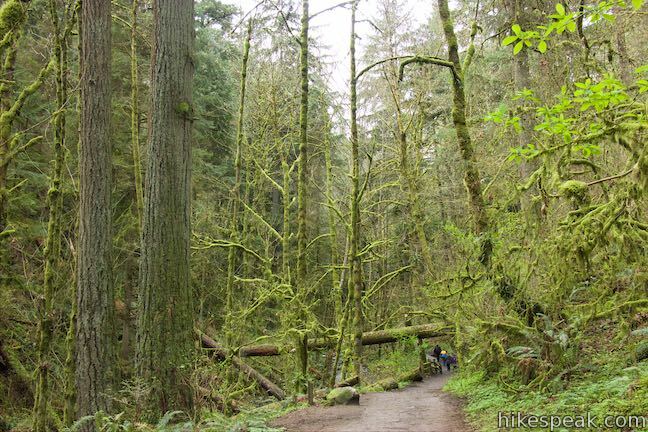 The forest seems to get denser as you go. 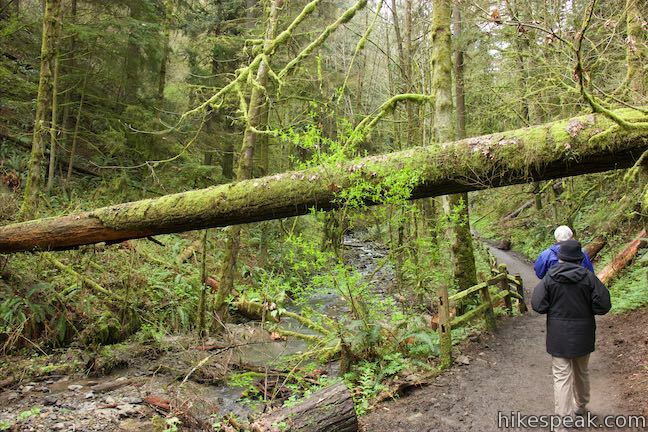 Are the trees getting bigger? 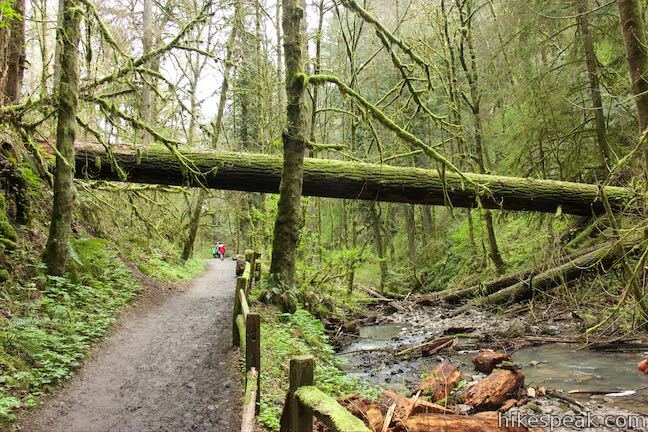 Pass a Douglas fir that is 242 feet tall and believed to be the biggest in Portland. 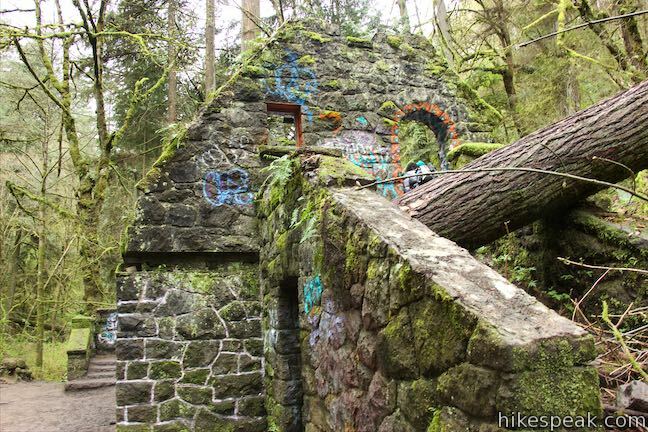 After 0.9 miles of hiking, come to a T-junction with Wildwood Trail in front of the Stone House. 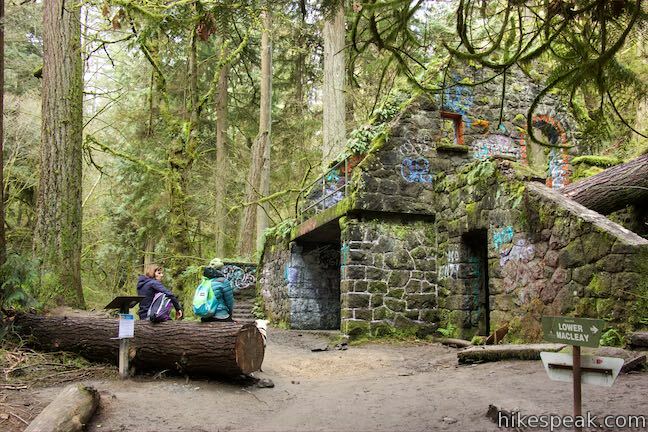 To experience more of Balch Creek, consider making a left turn in front of the Stone House onto Wildwood Trail. 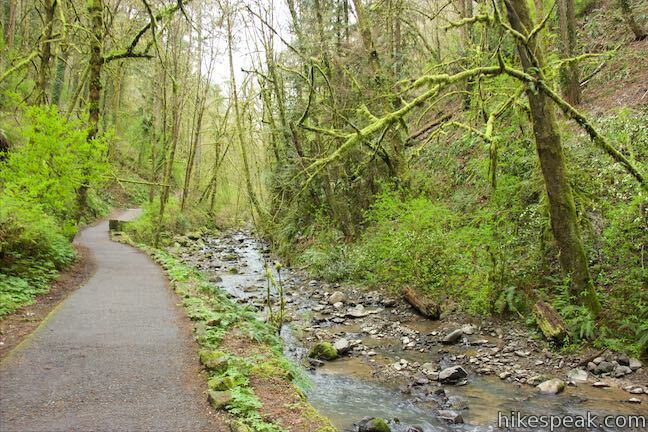 For a quarter mile, this trail borders the creek just like Lower Macleay Trail. 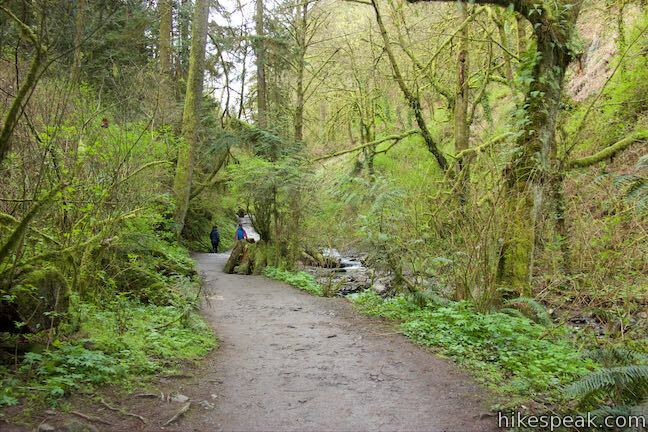 Once Wildwood Trail crosses the creek, it launches into a switchback-filled ascent up the side of the canyon. 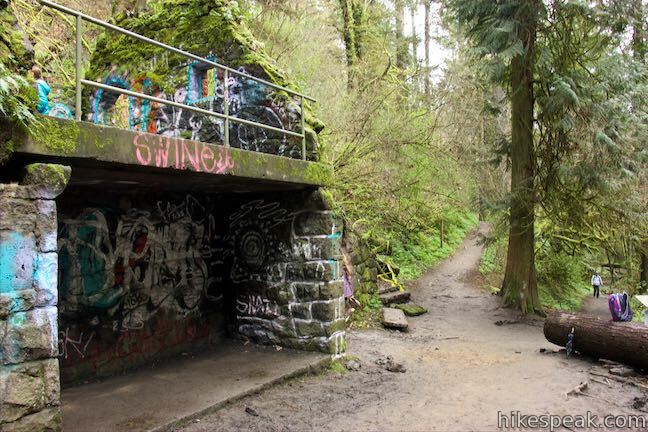 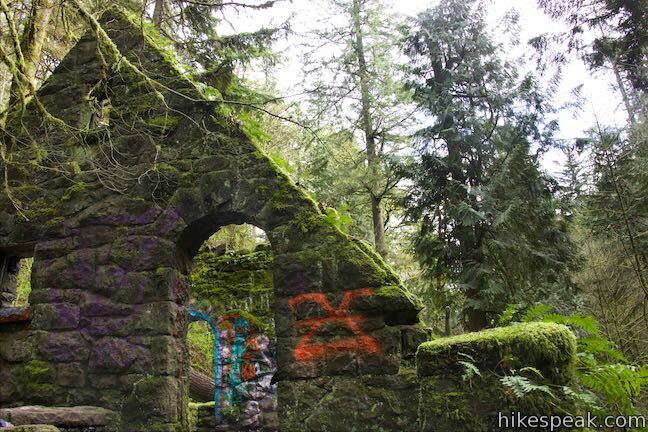 Proceed this way if you are interested in the Lower Macleay Park to Pittock Mansion Hike. 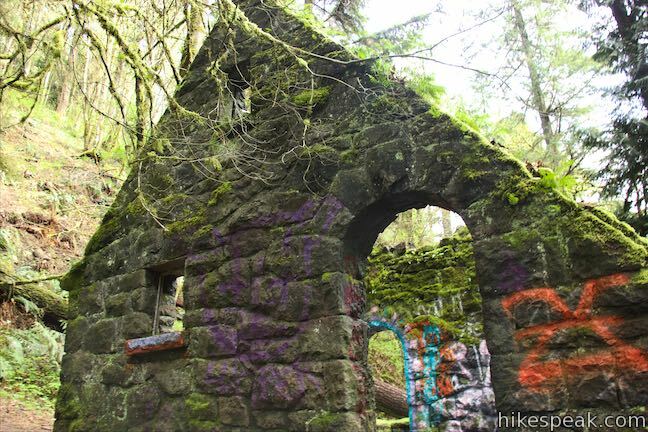 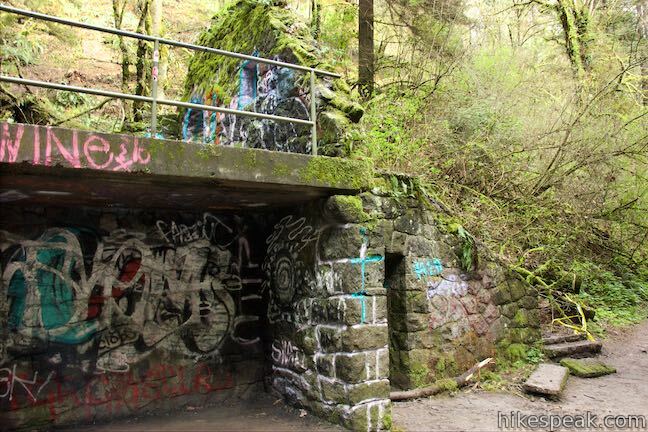 From the Stone House, you could hike back the same way on Lower Macleay Trail for a pleasant and easy 1.8-mile round trip hike with 210 feet of elevation change. 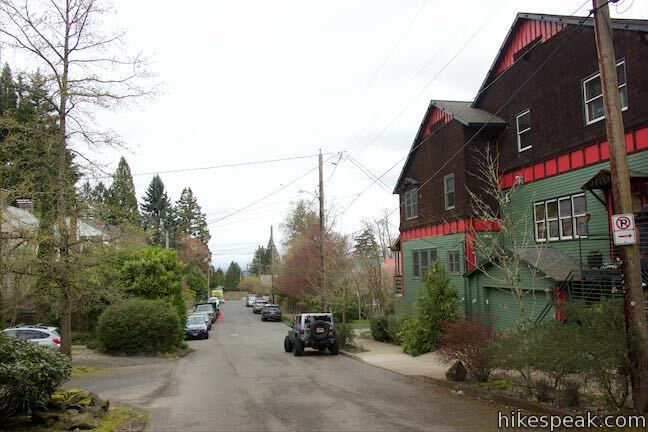 To mix things up and create a loop that passes through a neighborhood next to the park, turn right at the junction in front of the Stone House and head northeast on Wildwood Trail. 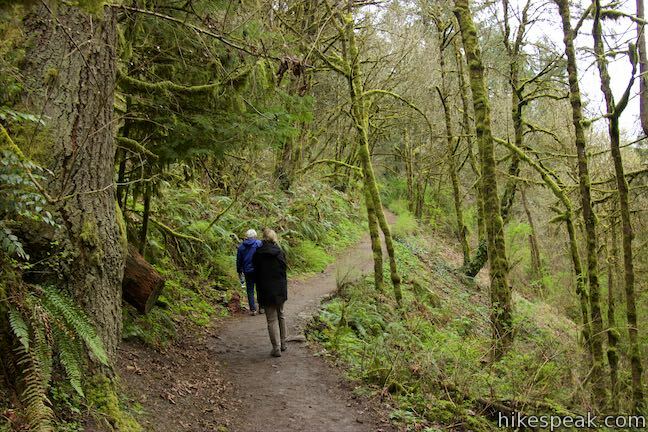 Wildwood Trail goes uphill on the side of the gulch above Lower Macleay Trail. 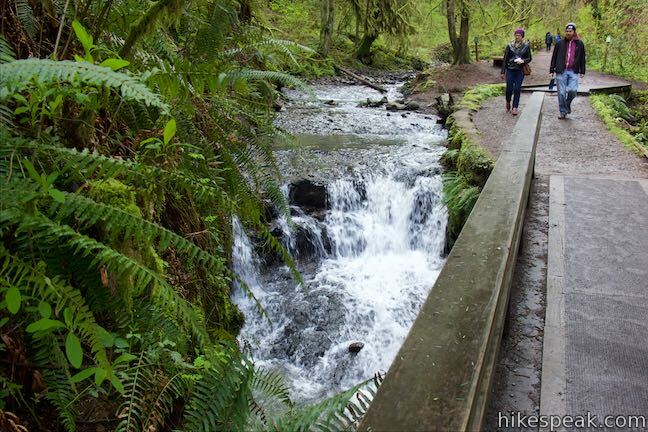 Look down over Balch Creek and the trail you hiked up. 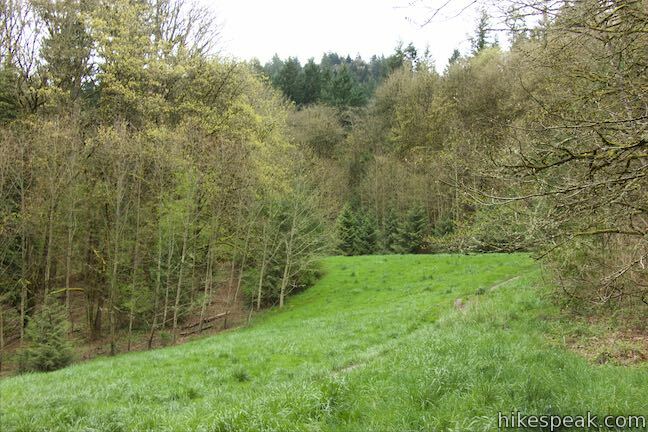 A tenth of a mile from Stone House, pass a path breaking off to the left and stay on what is obviously the main trail. 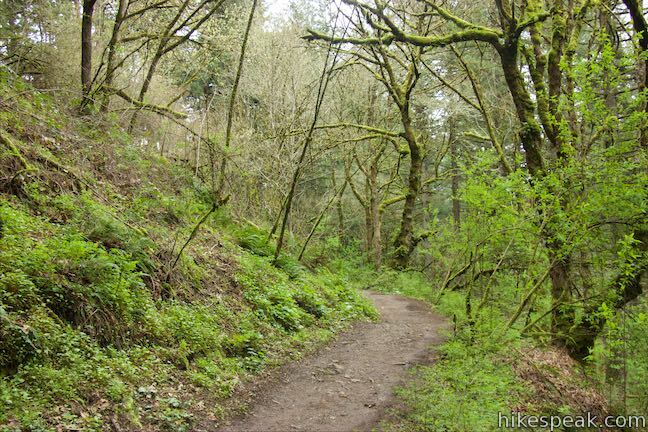 Eventually, Wildwood Trail separates from Balch Gulch and aims north across a wooded hillside. 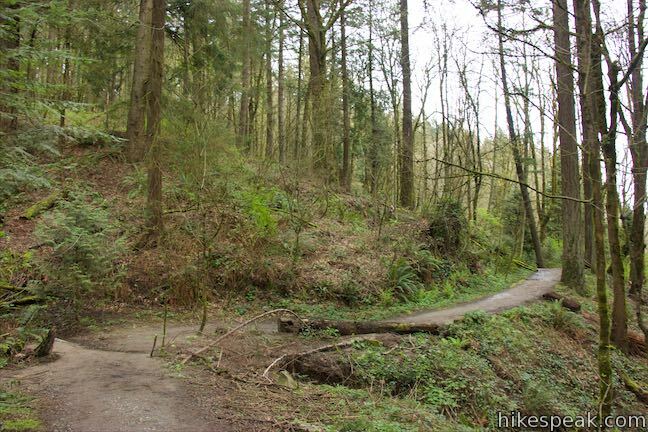 Less than half a mile from the Stone House, you’ll hit an intersection with Holman Lane, another wide dirt trail. 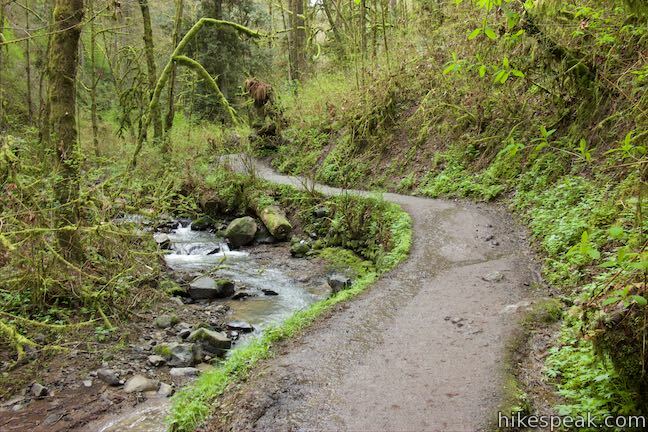 Turn right and hike 1/8 of a mile down this trail to a less used trailhead. 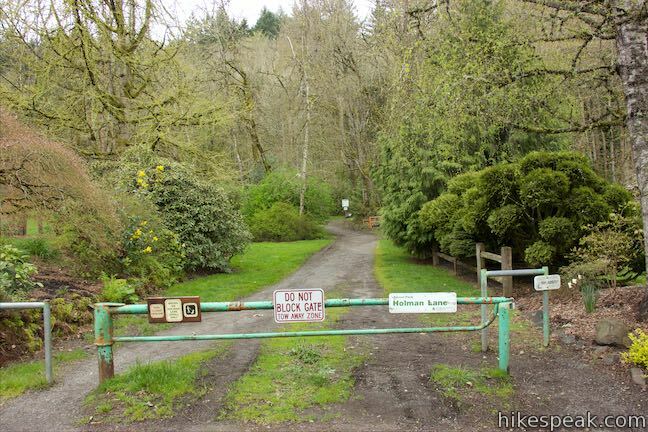 Pass a field on the right and go through a gate to enter Willamette Heights, a neighborhood in Northwest Portland. 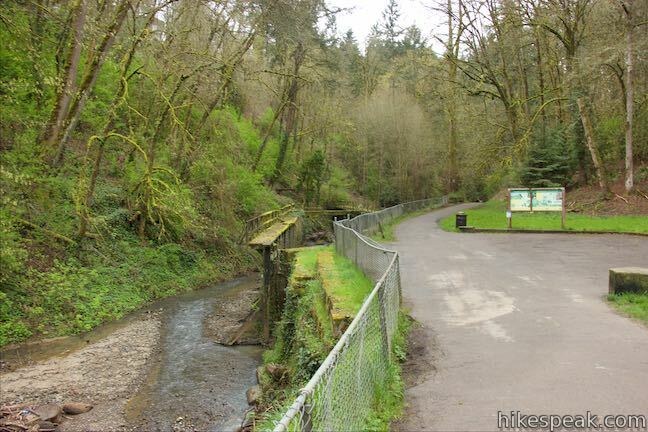 Now you’ll need to navigate through a few intersections to get back to Lower Macleay Park. 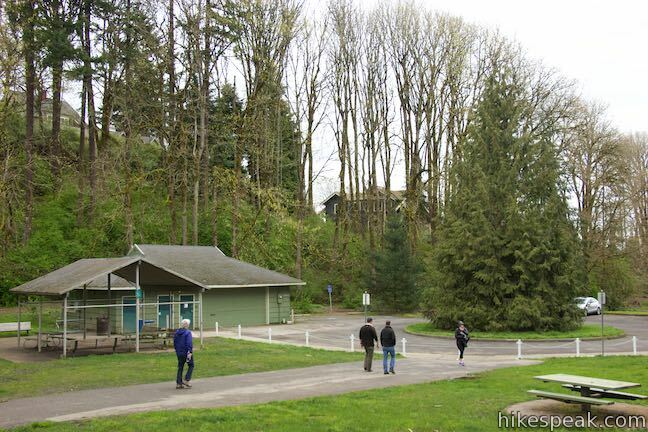 Walk to the first intersection in front of the gate and turn left down Aspen Avenue. 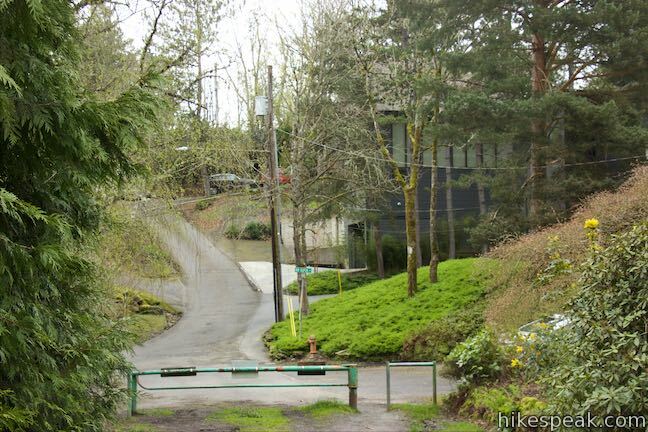 Go two blocks and turn right on Franklin Court (alternatively, you could go to the next bend on Aspen Avenue and turn right down a public staircase to Thurman Street and turn right). 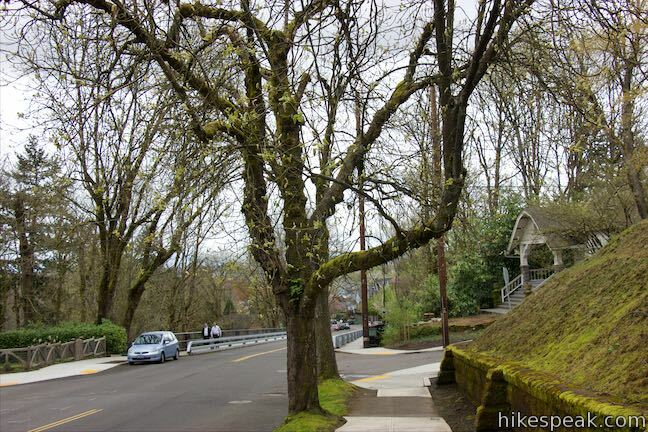 On Franklin Court, walk east until you come to a T-intersection and turn left on NW 32nd Avenue. 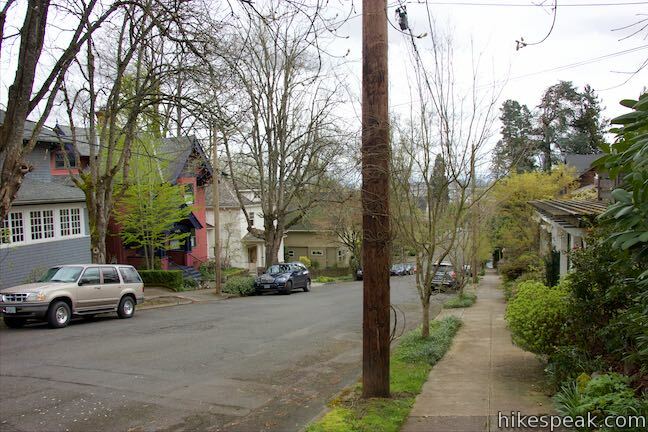 Make your first right on Thurman Street. 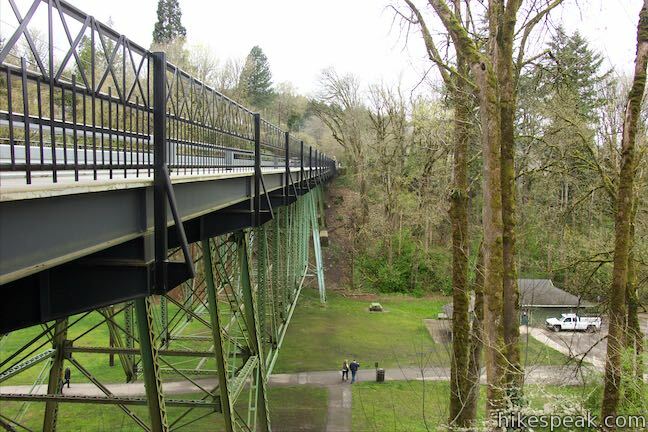 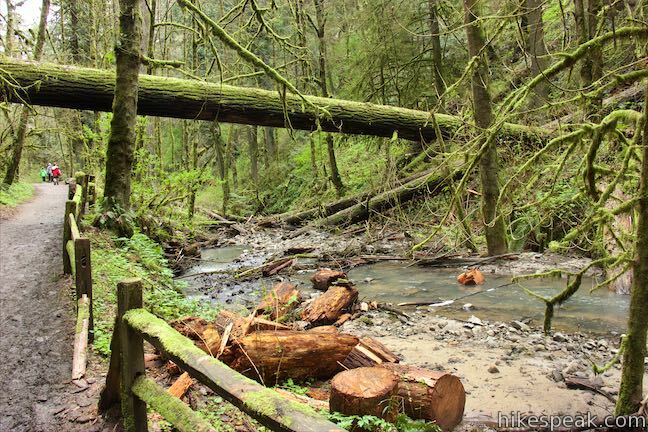 Go a block and continue straight onto Balch Gulch Bridge, which crosses over the top of Lower Macleay Park for a top-down view of the start of the hike. 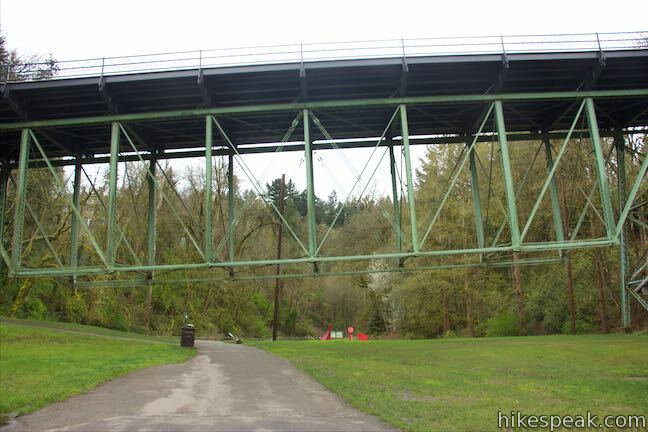 The bridge isn’t level and angles downhill more than you might expect. 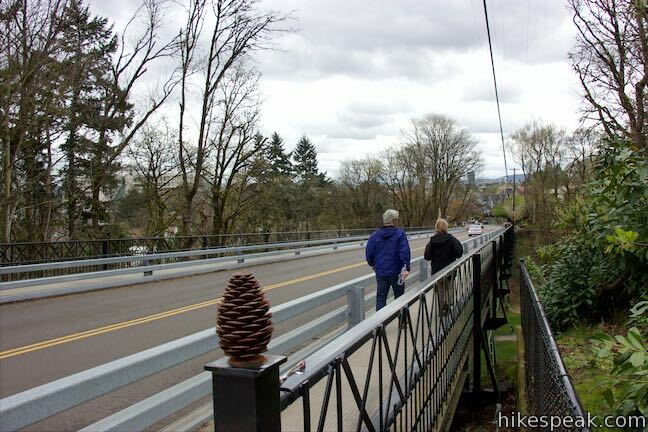 On the low side of the bridge, make a U-turn to the left and descend a staircase next to the bridge that goes down to the park. 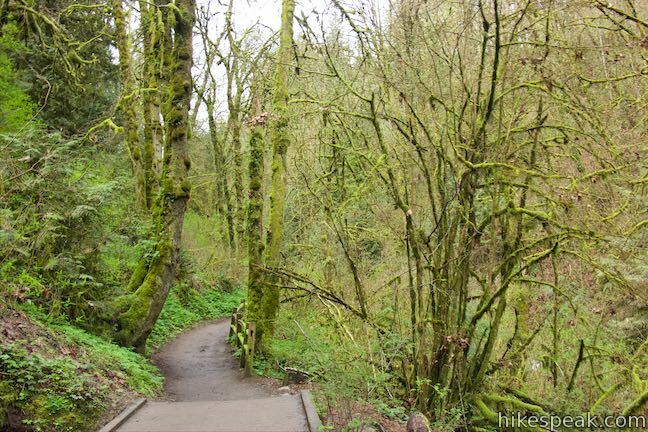 At the bottom of Lower Macleay Stairs, make the obvious right turn to walk back to the park entrance, completing this 2-mile loop. 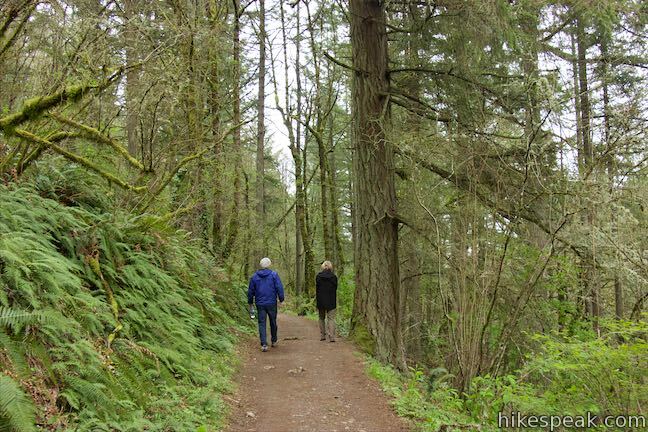 No permit is required for this hike in Forest Park and Macleay Park and there is no fee to park near Lower Macleay Trailhead (just observe the street parking rules). 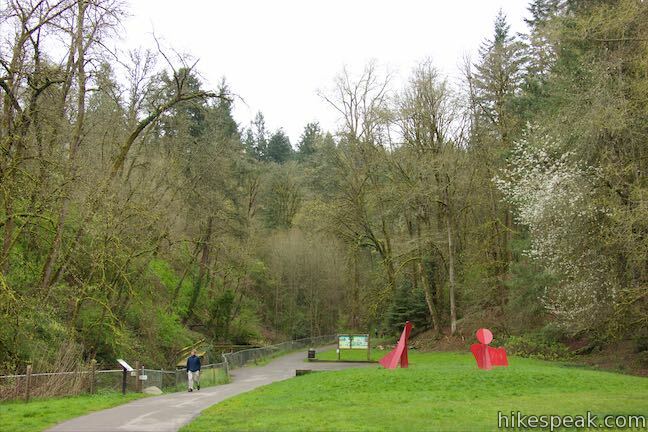 Dogs are allowed on this loop, but bikes are not (bikes are only allowed on Holman Lane, but can use other trails in Forest Park). 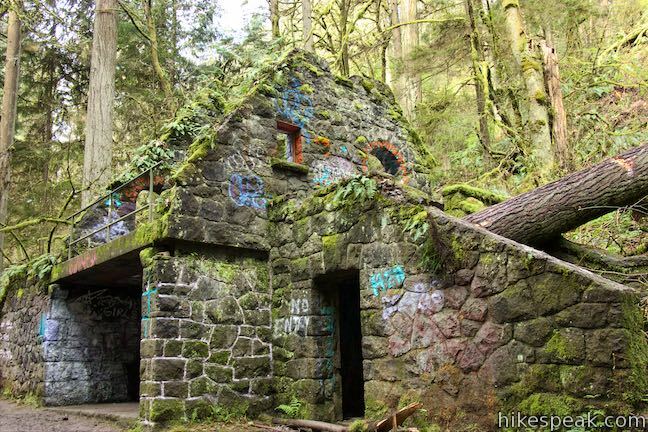 A bathroom is available at the trailhead.